All transactions are safe and secure with a reliable history in online purchasing behind each of our associates. 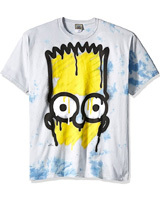 Buy the Bart Face t-shirt to own Simpsons clothing and merchandise. Choose either a Bart or Homer costume Simpsons t-shirt that displays either the face of Homer Simpson or his son Bart, depending on your preference (this style only features Bart). Wear your Simpsons tee as you enjoy one of the four types of Duff Beer, including Duff Dark and Duff Raspberry. Also, check out the Drink Duff Simpsons hat available below, and start building up your collection of Duff Simpsons merchandise. This is a good tee to wear under your Pin Pals Simpsons bowling shirt. In addition to the Bart Face tee above, browse the Simpsons Clothing Gallery for more apparel like men's and women's clothes, kids shirts or hoodies.